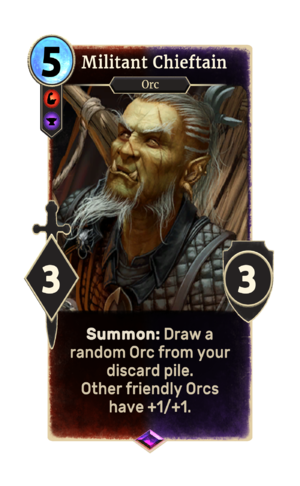 Summon: Draw a random Orc from your discard pile. Militant Chieftain is an epic Warrior creature card. It is part of the Core Set. "Been too long since I've embraced my rage." "Cower in fear or face my wrath!" This page was last modified on 16 February 2019, at 15:50.